With the heat of the summer sun fast approaching, people will soon be setting their taste buds for something cold, sweet, and delightfully refreshing. Who can blame them really? The rise in temperature makes for a great excuse to lick ice cream off a cone or slurp a fruit shake with much gusto. When in Manila though, it’s best to cool off with a traditional Filipino dessert, one of them being halo-halo. It’s the dessert Anthony Bourdain once praised to be “oddly beautiful” with its mish-mash of ingredients. A pillow of shaved ice adorned with different ingredients and at times topped with a scoop or two of ice cream. Definitely a deliciously mouth watering treat and a sight to behold on a sweltering day. 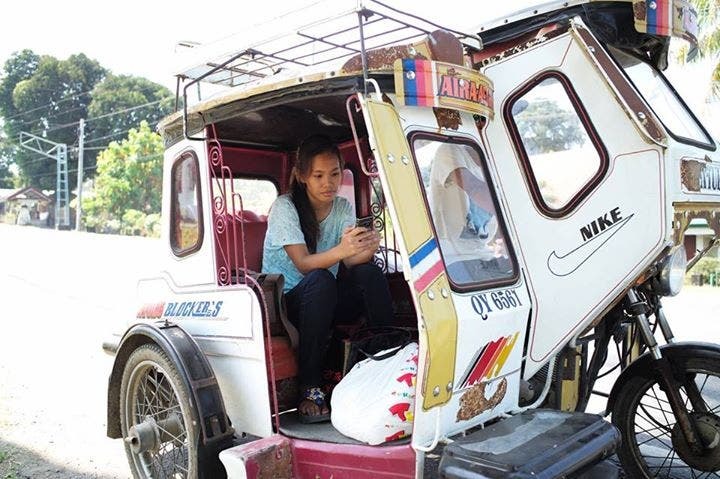 In preparation for the summer season, Mang Inasal, the much-loved brand of Chicken Inasal, has recently released their own for the public. 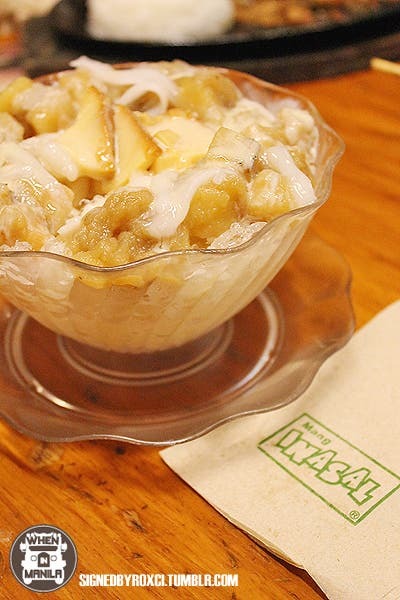 The Crema de Leche Halo-Halo, which is the restaurant’s latest offering, takes a twist on the dessert and highlights key ingredients of the summer favorite: milk, leche flan, macapuno, and saba banana. Upon first glance, the Crema de Leche Halo-Halo seems to be a humble offering. Cuts of saba banana line the edges of the bowl and are interwoven with strips of macapuno. In the center sits an absolute crowd-please – three fairly sized slices of smooth leche flan. All of these rest on a bed of shaved ice and a heavy pour of Mang Inasal’s creamy sarap milk. 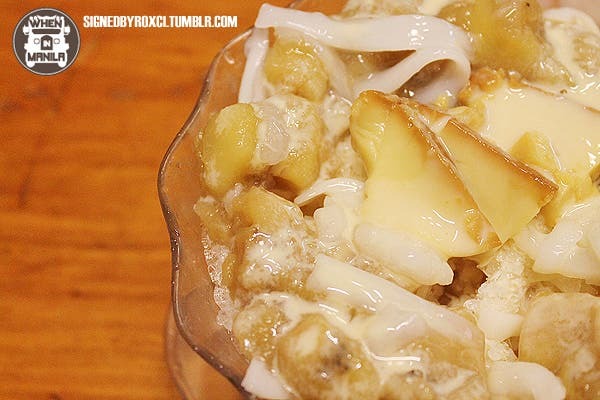 The Crema de Leche Halo-Halo is perfect for people looking to try a “white halo-halo” and those who have a preference for milk based desserts. The restaurant’s creamy milk is the star of the dessert bowl, as it provides a balance to the sweet flavors of the halo-halo. The consistency of the milk is just right too – not too dense and yet not too watery – thanks to the thickness the other components of the dessert give. Craving for a spoonful of the dessert? 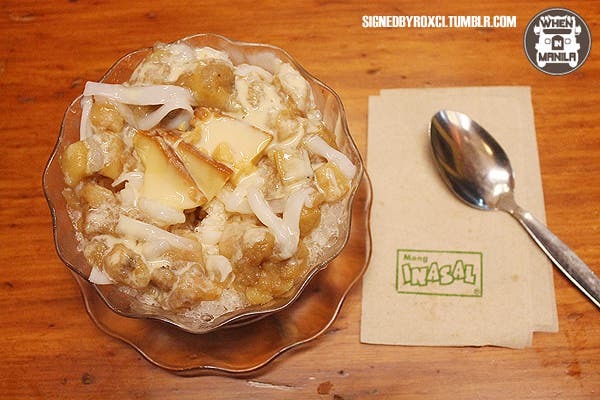 Then head on over any Mang Inasal branch and get your fill of their Crema de Leche Halo-Halo! Don’t forget to take a photo and share your thoughts on Facebook, Twitter, and Instagram by using the #CreamySorpresa hashtag!